People hold onto books for a variety of reasons. If you have a favorite title or two, you may keep them for sentimental reasons, or to read over and again. Books you enjoyed as a child, or ones you purchased for your firstborn, might find a permanent home with you to pass on to future children. Some people even keep their college textbooks for reference, especially if the content is still relevant to their work. Of course, we can’t leave out the collectors, those who browse used bookstores for a rare gem. Too many books, not enough storage? We can help! This summer, we imagine many people in Hampton Roads will take a book to the beach or relax in the backyard with the latest bestseller. If you find the books have stacked too high in your home and there are more pages than shelves, you will have to think about storage. You can never have too many books, but it’s important to have the right storage options so they remain in good shape. At Tidewater Drive Storage Center, we recommend self-storage for homeowners and renters who need a long-term solution for book storage. Whether you are transitioning to a new home, or wish to keep your library in a safe place you can access, renting a storage unit in Norfolk is a great idea. Once you’ve decided to move your collection, it’s important to properly pack your books to protect them from damage. Here are a few guidelines. Use plastic bins with sealed lids for books. This can help keep out mites and insects that munch on paper and binding glue. Since storage units do not have windows, you don’t have to worry about light exposure fading book covers, and you can opt for clear bins to spot the books you need when you access your unit. You may also want to include in each bin a list of all the books held within, so you’re not sifting through multiple containers looking for what you want. Store books flat wherever possible. This helps prevent book spines from warping or cracking. Never stack a book with the spine faced up. If you have to store books upright, position them in the bin as you would on a bookshelf. For your rare first editions, add extra protection by placing them in plastic sleeves. 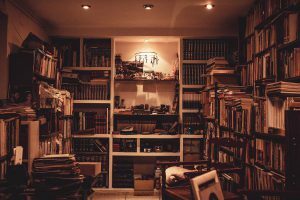 Use a climate-controlled self-storage unit and keep your library in low humidity, as exposure to heat can cause damage. If you have questions about storing your library, your bookshelves, or other furniture and belongings, contact Tidewater Drive Storage Center today. We are happy to provide you with the right solution for your self-storage needs.